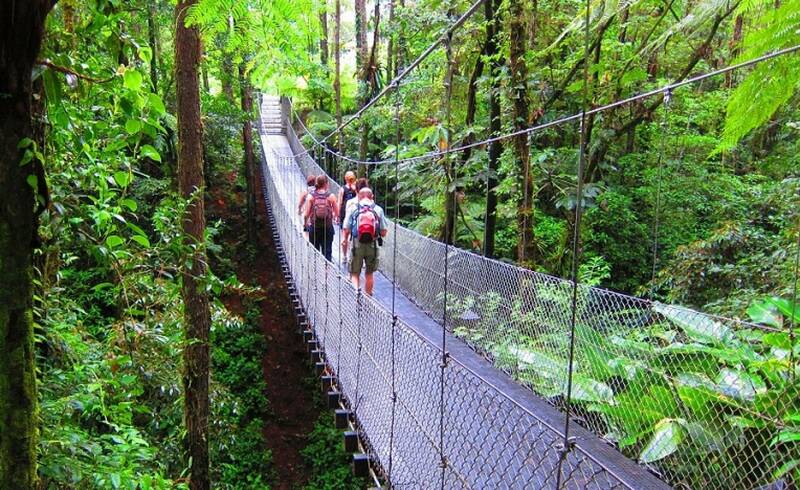 Having done the pickup we go on a 20minute drive to a beautiful park at the foot of the Arenal Volcano. The tour starts by hiking the dense forest trails that leads us closer to the Arenal volcano. After about an hour of hilly trails, passing many huge trees, we leave the tropical forest. Reaching an open area you can have your first good view of our tours destination...the Arenal volcano. Crossing some farmland we reach a pretty green lake that lays at the edge of the lava fields. After a short pause we pass the cemetary of the victims of the second explotion of the´68 eruption. We now start climbing a staircase that takes us on top of the lavafields. Follow the trail cut through the sharp rocks we reach the highest existing viewpoint. 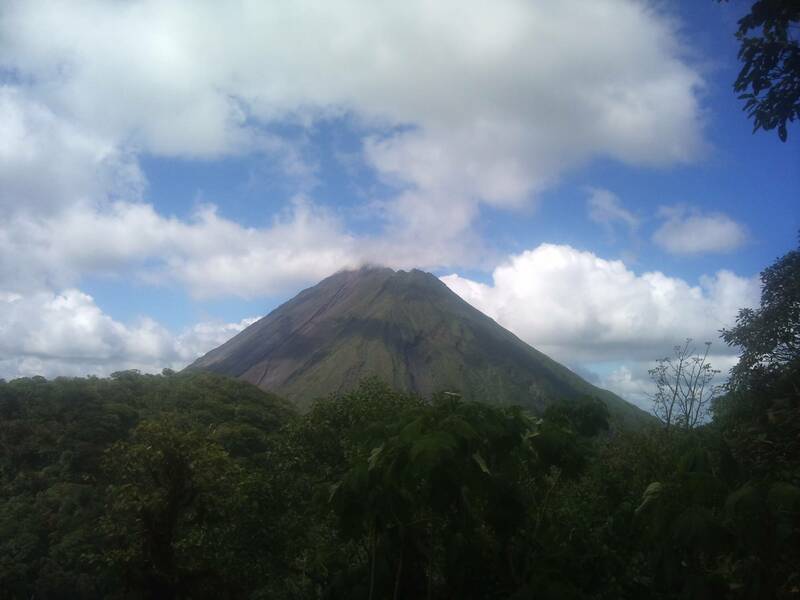 Standing here you´ll be amazed by what you see: the lavafields, the Arenal lake, the plains of the northern lowlands, endless forest, and of course Arenals massive cone towering over you. 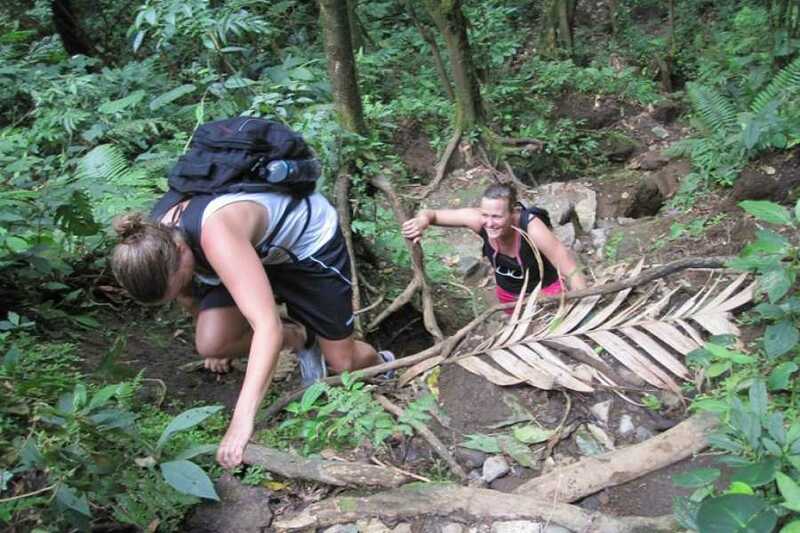 Hiking away from the volcano we explore more forest in which we have a good chance of running into wildlife. 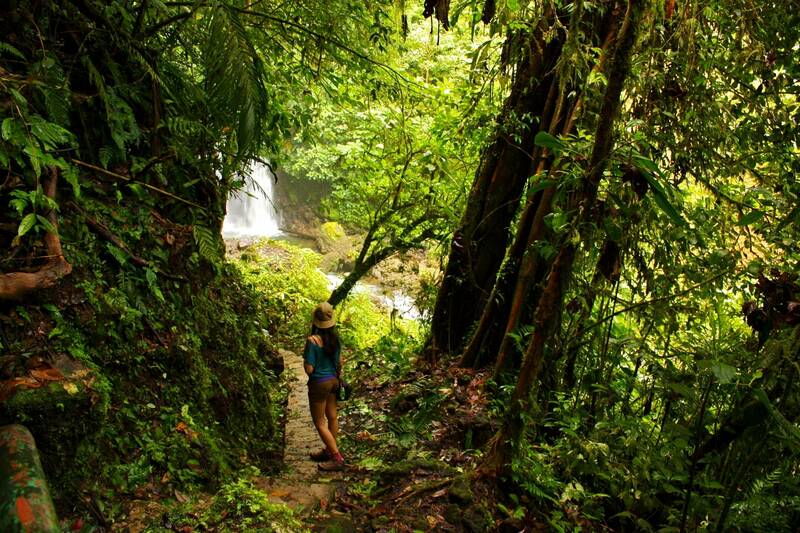 The guides will be there to show you and tell about the fascinating ecosystem of the rainforest. After enjoying the lunch package we provide we head down to the Observatory park. 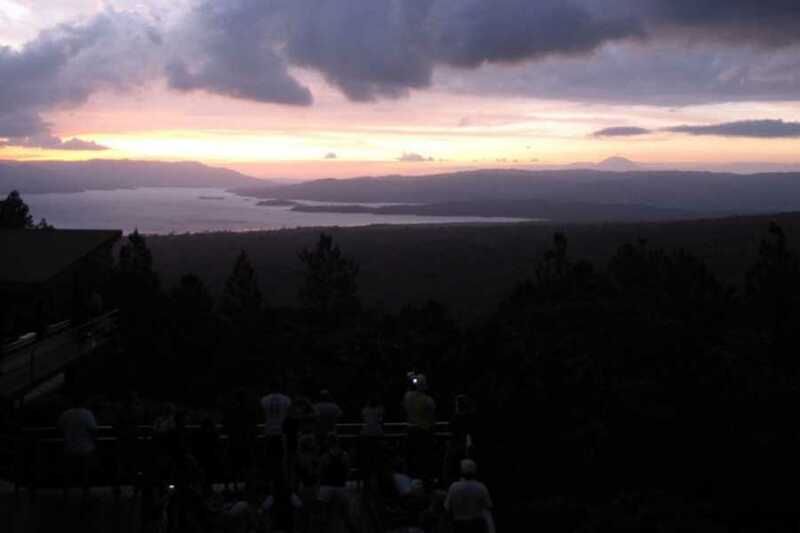 At the observatory park you can enjoy the panoramic view of the volcano and lake from another spectacular angle. From here we go on a light hike through gardens, farmland and forest. 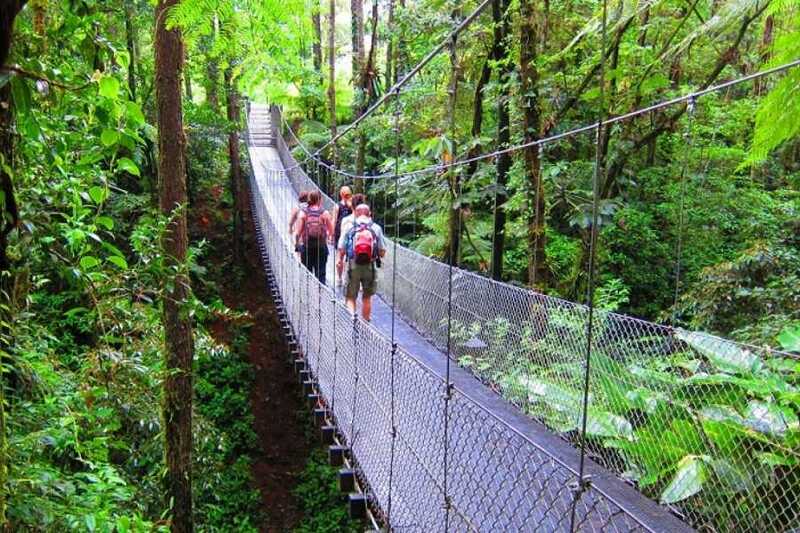 You pass two hanging bridges and visit the Danta river and waterfall. In the waterfall you can go for a refreshing swim or just relax and enjoy the scene. Leaving the forest, you reach the Arenal scientific Observatory. In it you can see the seismograph and your guide will explain more about the volcano with the help of images and pictures in its small museum. We end the hike at the deck where we hope to catch the sun going down over Lake Arenal. We have some tasty Costa Rican coffee before we get into the bus that will take us to the last part of our day. 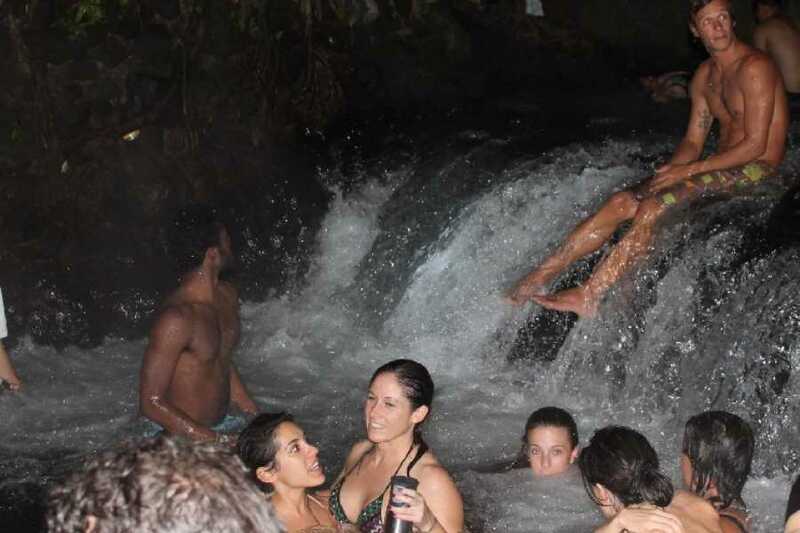 To finish the tour, in the most relaxing way, you will be taken to the natural hot water river. You can relax in its soothing warm water for about an hour and you can enjoy a volcanic mud facial and a complementary cocktail. Your tour ends at approximately 7.30pm when you are dropped off at your hotel. We will try to have everybody in our office around 9:30am. Depending the distance from your hotel to our place we may be picking you up from as early as 9:15. At the La Fortuna town center hotels we pick up around 9:30. Get in touch with us if you want a more exact pickup time. At our office we will give you your lunch package and do a last check to make sure you are well prepared for the hike. From our office it's a 20minute drive to the departure point. We aim to start the hike around 10.30. The hike, that ends at the Observatory lodge, will take untill 5:30pm. From here we go on a 20m. bus ride that takes us to the hotwater river. We will stay in the river for about an hour and then start the drop off route to go to the different hotels. The tour normaly ends around 7:30pm. Includes: Entrance fees, Lunch, Guidance, Logistics, transportation in La Fortuna Central Area, Mud Treatment and cocktail.